We love to torment the rest of the school with the aromas from our food appreciation classes. This week was more wickedly fun than ever. “What are you cooking in here!” bleated numerous visitors to the multi-purpose room kitchen. The moral of this story: people talk a lot about the benefits of vegetables, but what really gets their digestive motors running is the smell of meat on the grill. Being currently in Turkey on our virtual world culinary tour, the meat in question must be a kebab. 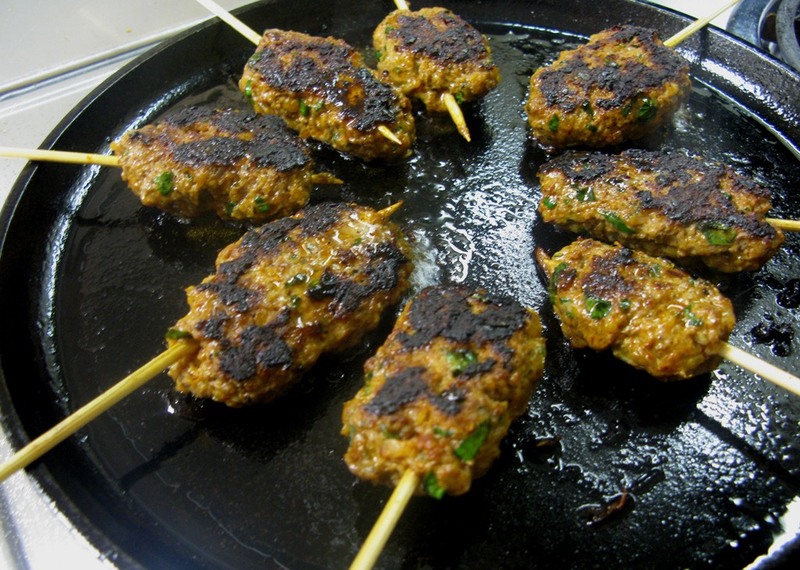 And what better choice for kids than what amounts to a meatball on a stick, known in Turkish as kofte–in this case ground lamb seasoned with paprika, cumin and onions. The way the Turks turn a meatball into a kebab is to shape it around a wide skewer so it doesn’t spin when you turn it. Not having wide skewers, we used the thin wooden ones from the local supermarket and they worked fine. And not being able to grill our kofte, we made do with a cast iron griddle on our electric stove. One side note to this recipe: sometimes world events can adversely impact our best intentions in the kitchen. The original directions for these meatballs called for the inclusion of Aleppo pepper. If you’ve cooked Middle Eastern food much at all, you’ve certainly heard of this spicy pepper powder from the market capital of Syria. But with Syria being torn apart by civil war these days, Aleppo pepper apparently has grown scarce. The owner of our local Middle Eastern market said she hasn’t been able to find it. We substituted a spicy smoked paprika from Spain available at Whole Foods. Also included in this recipe is a common Turkish ingredient not so well known here: ground sumac berries. These rhus are in the same family as the sumac you commonly see along the highway here in the States, with their long stems of compound leaves and cones of brilliant, dusky-red berries. I’m not sure anyone here would think of eating them, although historically they have been used to make a beverage called “sumac-ade.” They are readily available in Middle Eastern markets and also available from on-line spice purveyors. The ground berries taste vaguely like chili powder, but a little sweeter and huskier. If you don’t have any, consider it an optional ingredient. 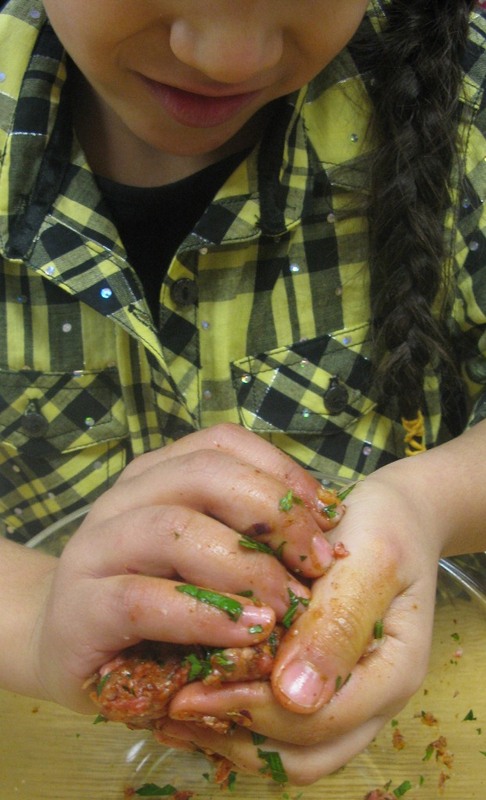 The fun part for the kids is blending the meat and all the spices together by squishing it through their fingers. They sanitize their hands first, then carefully pick any stray bits of meat and parsley off their mitts and place it back in the bowl before washing up with soap and water. The next step is to scoop out about 2 tablespoons or more meat mix and roll it into a ball in your hands. The ball should be somewhat larger than a golf ball. Then on a clean work surface gently roll the ball into a thick log shape. Insert a skewer through the middle lengthwise until the tip just reaches the end of the log. Gently press the log to somewhat flatten it. But don’t make a pancake out of it! You’re just trying to make the kebab a bit easier to cook. Place the kebabs on your griddle (or grill) and cook on both sides until well browned or even a bit charred and cooked through. Now you are ready to eat them like lamb popsickles. And in case you never thought you’d see your kids wolf down spicy lamb meatballs, you are in for a shock. Note: You could make a dipping sauce for these. I’m thinking of something involving yogurt and lemon. And if you plan to cook your kebabs on a grill over hot coals, you might want to soak your wooden skewers in water overnight first so they don’t burn.